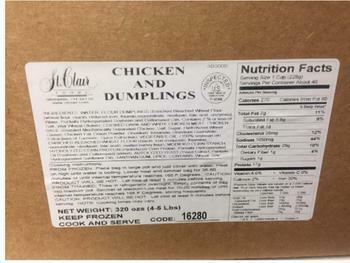 St. Clair Foods of Memphis, Tenn., is recalling approximately 26,800 pounds of chicken and dumplings. There are no confirmed reports of injury, illness, or adverse reactions due to consumption of these products. The recalled products, bearing establishment number “EST-6568” inside the USDA mark of inspection, were shipped to food service warehouses and distributed for institutional use in Alabama, Arkansas, Kentucky, Mississippi, Tennessee and Texas. Consumers with questions about the recall may contact Monica Wood ruff at (901) 322-7301.